I suspect that German cuisine is not very well understood by most people who haven’t spent much time in Mitteleuropa. The stereotype of the beer-swilling, sausage-eating Bavarian is just that: a stereotype which doesn’t begin to address the reality of everyday eating in Germany as a whole. There are vast regional food differences in Germany. According to my German friend Schorsch, a native southerner who has lived in the north for years (and who pines for the good bread and hearty, flavorful fare of the south), northern German cuisine shares more similarities with Scandinavia than with southern Germany—just compare the fish and boiled potatoes of the north to the hearty porks and pastas of the south. Yes, it’s true: even Germany has an “indigenous” pasta—several different kinds, in fact. Known as Spätzle (which is roughly pronounced “shpayt-slee”, not “spat-sull” as Anglophone TV chefs would have you believe), it’s a type of egg pasta that is actually more like long, skinny dumplings than tagliatelle, say, or the wide, flat Eastern European egg noodles that are so easy to come by in the States but are oddly impossible to find in Brighton. Spätzle is from the German state of Swabia. Its variations include Schupfnudeln or Bubespitzle, which are like the gnocchi of Germany, made with potatoes and often served with sauerkraut and bacon (very popular at Christmas markets and wine festivals), and Knöpfle, a variation from Baden which is made in the form of tiny knobbly dumplings rather than long noodles. For no particular reason (other than it was the first Spätzle recipe I ever tried and it works perfectly), the recipe I use to make Spätzle comes from a German vegetarian cookbook I bought years ago in Freiburg. The original recipe calls for a mixture of plain flour and spelt flour, which is quite lovely, but I generally just use the plain flour alone. A neat trick I picked up from my friend Schorsch last Christmas is to add a pinch of nutmeg to the batter for a subtle touch of extra flavor. Mix all of the ingredients to form a thick, sticky batter. Let the batter sit for about 15 minutes while you bring a big pot of salted water to the boil. When the water is simmering nicely, take your Spätzle press and spoon your batter into it. This might be a rather awkward procedure since the batter will be quite viscous, but don’t fret: with a sturdy rubber spatula and a bit of patience, you’ll be able to get the batter in without making a tremendous mess. Don’t fill the press/ricer more than about three-quarters of the way or else batter will squeeze out the top when you close it. When your press is ready to go, position it over the boiling water and…press! The Spätzle will glide into the water and sink to the bottom of the pot. When they rise to the top (it will only take a minute or so), scoop them out with a slotted spoon and drain them in a colander; then you can cook the next batch in the same way. You can mix the finished Spätzle with some butter and keep them warm in a covered dish in a low oven until you’re ready to serve them. Spätzle are a fantastic side dish for stews or anything with lots of gravy, German or otherwise. 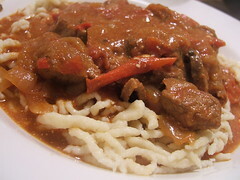 I love them with Belgian carbonnade, Hungarian goulash and French boeuf bourguignon. They’re also gorgeous with pork in mustard or mushroom sauce. 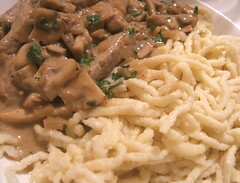 A ragout of wild mushrooms with white wine and cream would make an ideal vegetarian topping for Spätzle, or you could use Spätzle in place of noodles or rice in a soup. And then, of course, there is the classic Käsespätzle, which is like macaroni and cheese German-style: layer the cooked Spätzle with grated cheese (Emmental, for example) and golden-brown sauteed onions, heat it in the oven until the cheese has melted, and serve it with a green salad and a big mug of good beer. *If you do use a Spätzle press or potato ricer to make Spätzle, make sure you soak the thing in cold water immediately after you use it, because when Spätzle batter dries, it kind of turns to concrete (and I’ve found that soaking in hot water kind of cooks the batter onto the press, while cold water just dissolves the batter). I’ve spent an inordinate amount of time painstakingly clearing out all the clogged-up holes in my Spätzle press with a toothpick, and believe me, it’s not fun. 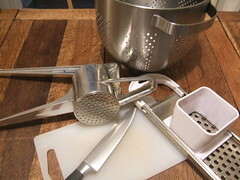 For a full pictorial overview of making Spätzle, check out Jeremy’s Making Spätzle set on Flickr! Try the fridge at the back of Yum Yum. I took me ages to find them because even the ‘fresh’ noodles don’t actually need to be refrigerated., so I didn’t think to look in the chiller. Thank you very much for this. I am really kicking myself for not buying a Spätzle press in Stuttgart when I saw one (a very nice one it seems) a couple weeks ago. My Scwabian friend Hans tells me "real" späetzle are made by hand; I have tried this using a large boiling pot of salted water and a wide cutter/spatula (almost like a plasterer’s spatula) with a wooden grip along one edge. The späetzle are "cut" using a wet board and the spatula, into the boiling water. The späetzle come out different shapes, but they still taste as good. The aim is not to make them too large , else they resemble Bubespitzle!! They can be prepared and then cooked separately with cheese (Kässpäetzle); I have also had them served cooked with schinkenspeck(bacon), not schweinespeck (bacon fat), mushrooms and a side serve of rotkraut(sweet and sour red cabbage). I am also told a classic scwabian späetzle fare is Linsen mit späetzle ( lentils with späetzle ). I hope this is helpful for your readers. This recipe is absolutely perfect for using with a ricer. So much better than digging out the spaetzlihoebel (wherever it’s hiding at the moment…)! Thanks so much for posting it! Great recipe, and interesting post! I adore späetzle, though have never tried to make it from lack of a press. I may try with my ricer though. Coincidentally, I just stumbled across this blog via wordridden… It’s good to see another Brighton-based foodie blogger! I am still looking for some good receipes for spatzle with mushrooms. This started with a picture of the dish I am looking for but the receipe was not included. when I was stationed in germany, several years ago, I made friends with a german family that taught me to make to spaetzel noodle. Their version of the meal was to layer noodles and swiss cheese in a casserole dish and then bake it in the oven till cheese is melted and lightly brown also you can add fried onions to give it more flavor. We season it with pepper. Add a salad and its meal. I make the spaetzel from scratch then layer it with mixed yellow cheeses and onions that have been well carmelized and dark. Then I pour a mixture of beaten eggs, milk,powdered mustard and fresh ground pepper over it and bake til a solid casserole. It is always a hit! Freezes well too if you only half bake it. 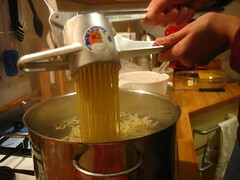 The easy way to make Spätzle with the german Spätzlewonder is here: http://www.spaetzlewunder.de/index.php/Home/Cook+and+Enjoy? I hate it made as little dumpling like globs. A press that makes it noodle-like is the way to go. Why do restaurants insist on making it the dumpling way? Is this ‘by hand’ like purists think it should be? I also like mine lightly fried with lentils. This is an excellent recipe, I’ve never thought of using a ricer. My family always used to make "knockeln", which are like giant spatzle dumplings. My girlfriend hates them though, they are too heavy, and I’d never tried making spatzle as I thought it was too hard. Thanks for this recipe! I can’t wait to try it. I was just about to order a Spätzle press when I decided to do a little research first. Now I know I can use the potato ricer that is already in my cupboard! I’m just at the beginning of my own culinary adventure. You see, I’m raising my 2-year-old son to be bilingual in English and German. We live in the US, so it’s important to me to try to incorporate as much of the culture as I can. So I’ve decided to start trying out recipes from German-speaking countries. I’ve only made one so far (Rösti from Switzerland), but it was a lot of fun! Okay, Aleksander wasn’t so interested, but he’s only 2, so we’ll keep trying :) I really enjoy the way you write about food! I’ve tried spätzle every once in a while when traveling in the German speaking world, and wondered whether it would be easy to make them. Now I know. However, I don’t own a ricer and I’m not going to buy a spätzle press, and actually I’m also a bit like that, so I’d like to try carving them out by hand. Now do you have any technoque tips, should I make a dough ball and slice them as I’ve seen chinese chefs make noodles in the TV, or should I roll the the dough to a flat slab and cut little rinds out of it? 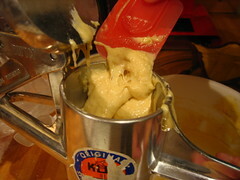 The batter needs to be quick sticky, as you can see in the picture above, so to make Spätzle by hand you actually need to kind of spread the batter on the board as if it were a thick paste, then hold the board above your pan, slice each noodle off and push it into the boiling water. I’ve only seen it done once and I’ve never done it myself, so can’t offer you any advice - though there might be videos online that will help you out. Good luck!